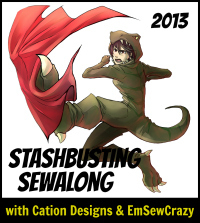 I, Sharon, commit to reducing my stash fabric by at least 30 yards in 2013. I also commit to not buying any new fabrics or notions—except those explicitly needed to finish a current project—until the end of the year. I'd actually like to commit to use more yards, but I'm not sure once the weather turns nice how much time I'll have in my sewing room. I'll try to use 60 yards, which is 5 yards a month, but I don't want to commit to that much. Also, I'm supposed to show a picture of my stash. 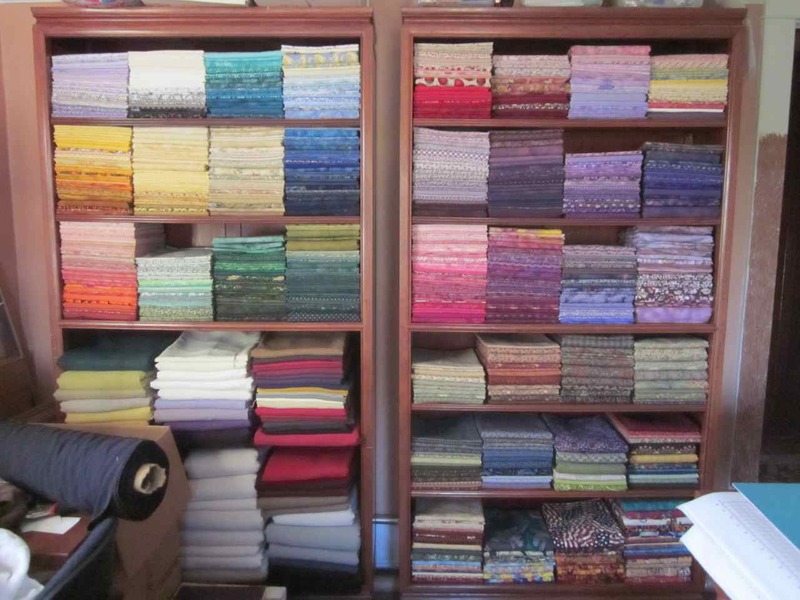 This is most of my quilting cotton yardage. There are some more big chunks—purchased for quilt backings—hanging in the closet. And some small cut squares and fat quarters in tubs. And a large scrap tub that I've made a dent in this month. By accident, I managed to do the assigned project for January, which was to "Sew up those remnants left over from another project, use up some of those tiny scraps that you've been saving...as long as it's less than a yard of fabric, it counts!" Check! I'm also going to try and figure out a stash counter for the sidebar. I'm down at least 5 yards already with my latest project and it will soon be 10. Jeff persuaded me to make the lap quilt double-sided so I'll be making a second panel, basically the same, for the backing. I will need to put larger borders on it for the machine quilting, but most of the excess will ultimately be cut off when I finish the binding. I spent today cutting out all the pieces so I could get right to work tomorrow. I actually had to cut into some non-scrap fabrics to get some more variety in the fabric selection.